In a month from now, we’ll be in the Eurovision week itself! Host broadcaster KAN thought it was time to give the world an update on what we can expect in May! The 1st semi-final will kick off with the woman who brought the contest to Israel in the first place: Netta will open the first semi-final on May 14 with a new version of ‘Toy’ as well as a new, yet to be released song, (at the end of April)! Also present during the first semi-final and in the final as well is ”Diva” Dana International! The song she’ll be singing there is still a surprise but is being described as ”powerful”! This year’s slogan is ”Dare to Dream” and in relation to that, the Shalva band, known from this year’s Israeli selection show Rising Star, will take the stage during the second semi-final singing the song ‘Million Dreams’. She was rumoured as one of the top choices for the hosting job this year, which fell through due to scheduling issues (she’ll be shooting Wonder Woman 2! ), but world famous actress Gal Gadot will be part of the final afterall! What her participation will look like is still being kept a huge secret by the production team! Another Israeli star that will be gracing the Grand Final stage is Idan Raichel! In his case we have more information to share: together with 24 singers and other musicians he will be performing the song ‘Bo’ee – Come to Me’. At the end, all 26 finalists will join Idan on stage. And last but not least: you’ll be singing a special collaboration! 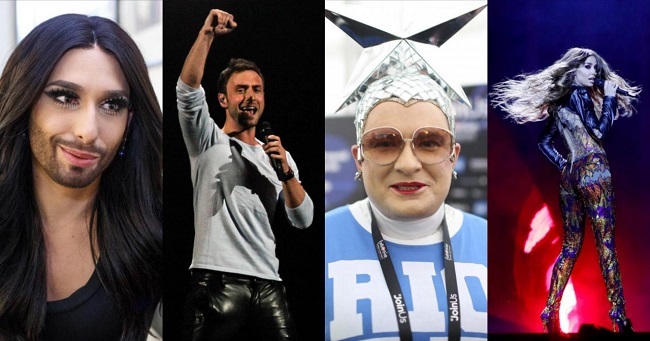 The beloved Eurovision stars involved are Conchita, Måns Zelmerlöw, Eleni Foureira and Verka Serduchka and they’ll be performing eachother’s songs! At the end all four of them will join Gali Atari on stage to sing the song she won with for Israel in 1979, together with the band Milk & Honey: ‘Hallelujah’. This year’s Opening Ceremony will take place at Habima Square in Tel Aviv. And the artists will be walking an Orange Carpet this year instead of a red one! The carpet will be leading to the Charles Bronfman Auditorium where all artists and their delegation can take a drink and mingle. Habima Square, where the Orange Carpet ceremony will take place this year! This year’s Eurovision Village will be located in Charles Clore Park, situated along the coastline in Tel Aviv. The Eurovision Village will be open to the public every day starting 12 until 18 May from 17:00 IST until 23:00 IST. On 14, 16 May and 18 May, the days of the live-shows, it will be open until the live broadcasts finishes. On 17 May, it will be opened from 12:00 – 18:00 IST. Confirmed so far to be performing on stage at the village during the week are: famous singer Ivri Lider, Rising Star finalist Shefita, Israeli pop-rock band Ethnix, tribute group Eurofalsh and an ABBA cover band. You’ll surely want to know about the EuroClub as well! You will find it at Hangar 11 in Tel Aviv Port, and will be open from 22:00 – 4:00 IST, between 11 and 18 May but beware: it will only be accessible to accredited Eurovision Song Contest delegates! Did all these bits of information get you more excited already? The public review “Walking Out” by Srbuk!